The coming dawn chases the stars from the sky as the moon retreats to another hemisphere. The predawn light is soft. The line of the horizon, so sharp at mid-day is a blurred edge, the ocean bleeds into the sky. For a few moments before the sun takes dominance in the heavens, the world exists in cool pastel colors with softened outlines. She has no name except in the mind of God. Throughout the night she roosts in an Australian Pine, just a few hundred yards from where the gentle surf of the Gulf of Mexico meets the sand and the scattered shells of Sanibel Island. She stirs and pulls her long beak from beneath her left-wing. The rhythms of the tides, the moon, stars and sun are hard-wired into her DNA, she does not question them. She blinks once then twice. Flexing her strong wings she stretches the 7 foot wingspan parallel to the shoreline before pushing her feet against the rough bark of the tree, launching into the air. Wings beating, beating, beating, powerful strokes against the invisible air, until she gains the needed altitude. Then she soars. Soars on the wings of the morning. She was born to this, she was created for this. I stand with my feet planted firmly on the sand. Watching. Earthbound. Heavy. Logically I know I am a higher creature, but I cannot help but be envious. In 1776, Carl Linnaeus gave the brown pelican her binomial name, Pelecanus occidentalis. By conventional standards she is not a thing of beauty. 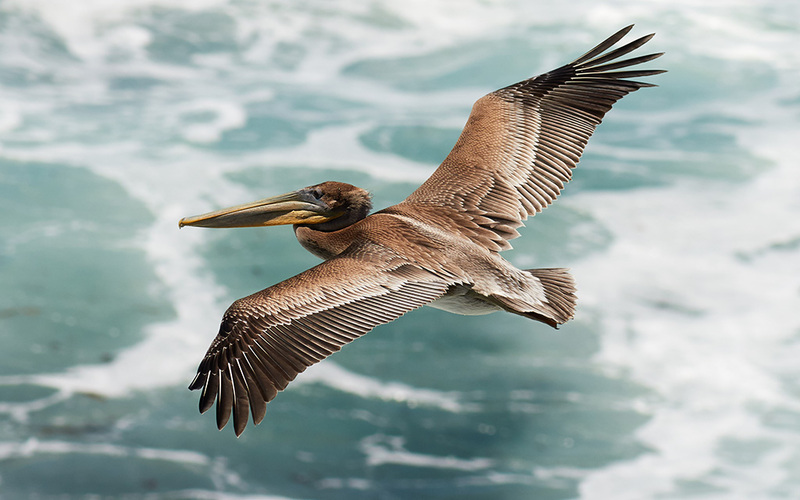 Until the brown pelican matures and its head feathers turn white, she clothed in a consistent dull brown hue. She is a comical looking bird, with an over-sized bill and stubby body. Her dive into the water to catch fish has all the grace and finesse of a falling rock. She will never be described as elegant or graceful. But she does not compare herself to other birds. The Royal Tern, the Roseate Spoonbill, the Ibis, the Great White Heron, or the Snowy Egret, she does not measure her beauty against theirs. She is comfortable in the knowledge that she is a magnificent creature of divine engineering. Her fall from the sky that we find so comical is designed to impact the water with such force that it stuns the small fish that are her prey. As she plunges into the water, her throat pouch expands to trap the fish, filling with up to 2.6 gallons of water. And oh, can she soar!